On this day in history, May 28, 1754, George Washington inadvertently starts the French and Indian War at the Battle of Jumonville Glen. For decades, France and Great Britain had competed for control of the Ohio River Valley. In 1753, the French began building a string of forts in the area and pushing out British traders. Governor Robert Dinwiddie of Virginia had been ordered to protect the area from French aggression. He sent a 22 year old Major George Washington with a letter demanding the French depart the area, but the letter was rebuffed. Dinwiddie then ordered the construction of a fort at the forks of the Ohio River and ordered Washington to protect its construction. Washington raised a small force of militia and Indian allies, including his friend, Mingo chief, Tanacharison. As they neared the location of the already under construction fort, they met the fort's crew, who informed them that a French army had demanded their evacuation, taken over the site and begun building their own fort, which became known as Fort Duquesne. When the commander of Fort Duquesne learned Washington's small army was approaching, he sent another officer, Coulon de Villiers de Jumonville, with an order that they leave French territory. Washington, who had been instructed by Governor Dinwiddie to repel the French, even if it meant bloodshed, had begun building Fort Necessity south of Fort Duquesne. When he learned of the approach of Jumonville's men, he decided to attack. Jumonville had about 35 men with him. Washington had 40 militia and 12 Mingo Indians who surrounded the French camp while many of them slept. When the fighting began, nearly all of the French were captured or killed within a few minutes. What happened next is murky because of conflicting accounts, but it would result in the death of Jumonville and the elevation of George Washington to a figure known in the courts of Europe for the first time. Apparently Washington, who did not speak French, was attempting to interrogate Jumonville and the communication was difficult. He may have left Jumonville unattended for a period, during which either Tanacharison or a militia member killed Jumonville in cold blood. Some accounts say Tanacharison tomahawked Jumonville in the head and washed his hands in Jumonville's brains. Others say a militia member shot him. The reason for Jumonville's killing is unclear. Washington's official account to Governor Dinwiddie states that Jumonville was killed in the battle, but doesn't state how. 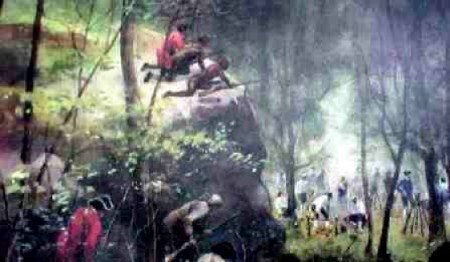 After the Battle of Jumonville Glen, a full sized French force came out of Fort Duquesne and chased Washington back to Fort Necessity. The French captured the fort and Washington surrendered on July 3, 1754, the only time he ever surrendered in battle. Washington signed a surrender document written in French that he could not read and may have not been translated properly to him. The document stated that Jumonville had been "assassinated" and Washington was later blamed of ordering the assassination by France. This affair led to the first time that Washington's name became known abroad in an international context. The result of all of this was an escalation of British and French troops in the area and the outbreak of the French and Indian War two years later.